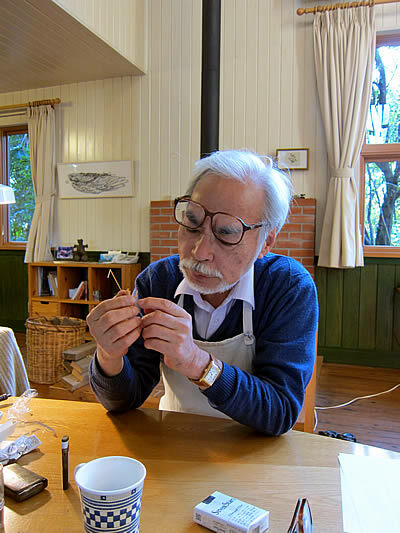 Mr. Miyazaki looking at first test shot figure and suggested "His chest is too thin. It making him look weak" It does look thinner than original molded. We fixed that for the production model figure. On September of 2013, Hayao Miyazaki announced retirement from movie directing. But he was at his personal office "Nibariki" located next to studio GHIBLI everyday. What was he doing?
" He is drawing very detailed comic draft for a modeling magazine" Studio GHIBLI's producer Toshio Suzuki replied in a certain interview. I'm sure our readers know the modeling magazine he mentioned is Monthly Model Graphix(MG). 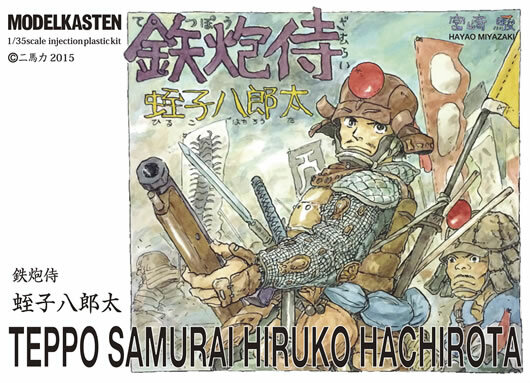 The draft, he was working on is Teppo samurai(meaning Matchlock samurai), a story of Hachirota Hiruko, a matchlock cavalry samurai who fights at front line in ongoing war between the Hojo's and the Uesugi's (Both powerful feudal lords)in years of 1560's Kanto area in Japan. 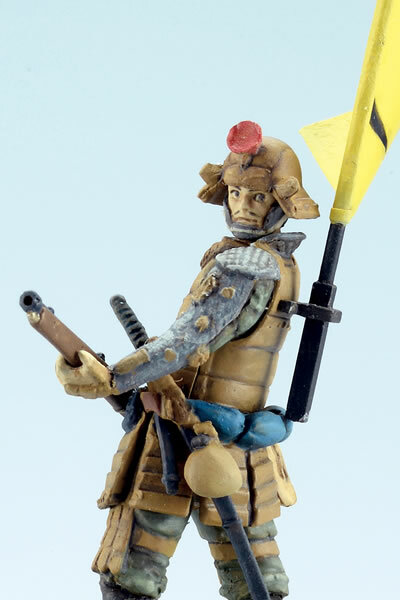 This idea of Teppo Samurai was actually older than production of the movie The Wind Rises. He started to draw the draft in September of 2013 and in about a year, he finished drawing first half of planned 20 pages long battle scene in the first chapter. Modelkasten thought his serial monthly article will start soon, so begin the planing of producing 1/35 scale Hachirota Hiruko figure. 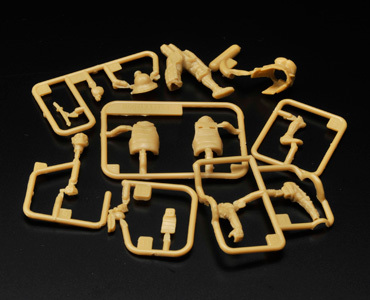 A known sculptor of our 1/35 high school girl figure, Rokujiro worked on the original mold of the figure and a Chinese company made tooling for the production figure. 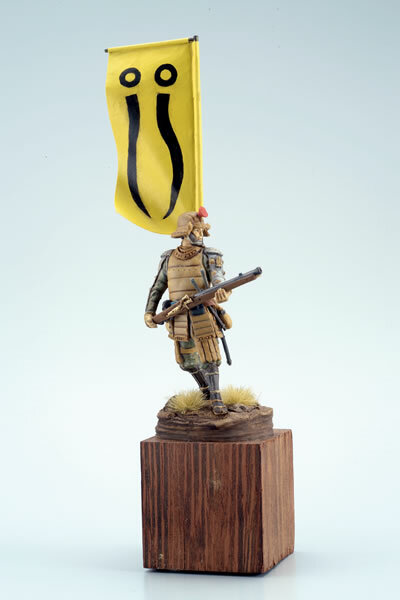 We also started monthly column on Armour modeling about Sengoku time period in Japanese history. 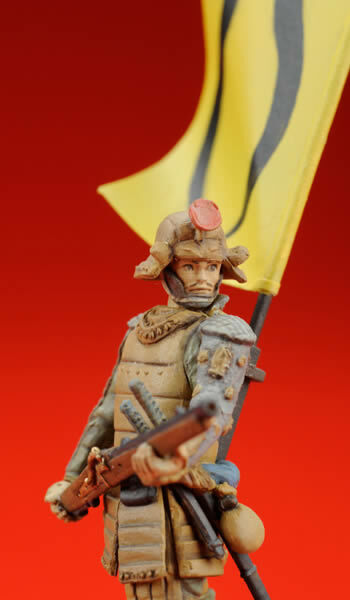 This was on going project with this Teppo samurai in mined.The first test shot of original figure arrived right after the column started on Armour Modeling magazine. It was unusually fast work for him. 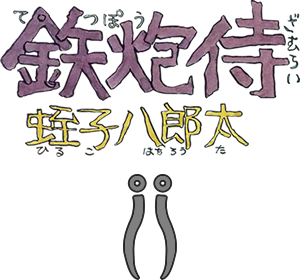 But almost at the same time Mr. Miyazaki's pen stop drawing and Teppo Samurai's serial article project also halted. The project is in a state of cancellation or postponed indefinitely. What really happened? To find out, we visited his personal office Nibariki and talked to Mr. Miyazaki himself. Miyazaki: I read all the books and information materials the modelkasten provided for me but I just couldn't consent with informations on those books. So I started drawing with my own ideas. My plan was to draw very active battle scene for 20 pages or so then tell people those scene are fake and wrong. After that is done, start working on more low key side of the war. That just did not happened. 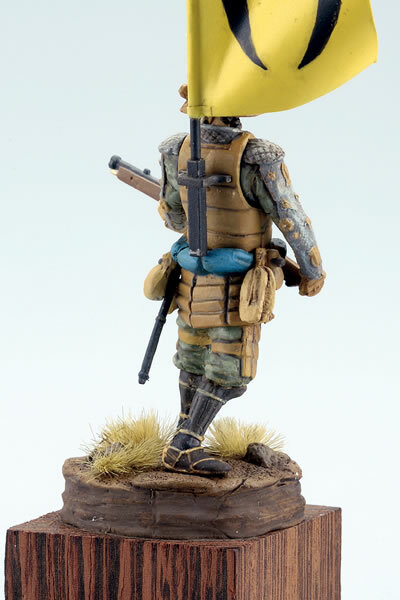 Model Graphix(MG): The first time we talked about this project, you told us you would like to draw every item a samurai carries to bhold for on guard duty at battle front of the feudal lord's war. Matchlock, gunpowder,led bullet,sword,casting tool for bullet, rice for him to eat, bowl,chap stick,cloth for change, futon and writing utensils. 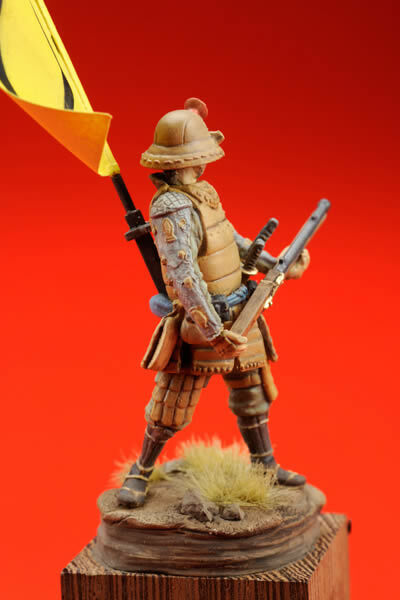 Samurai of this time period did not have supply line so he had to carry everything with him. That must have been really hard but would been very interesting to see in drawing. Miyazaki: The book said saltpeter for black powder was imported easily. But I wonder which port those minerals landed and how did they transfer to deep mountains of Kai and to Kanto plains? They say the Takeda's (also a powerful feudal lord of it's time who ruled deep mountains of Kai) had many guns too. They need route to get sulfur also. Match cord is made of cotton. So did they use importing route to get everything? Saltpeter was made underneath the horse barn in Edo time period but I think they did that from way more long ago.I wonder how did they transfer gun powder too. Could they move those important strategic materials through territory owned by other landlords? That is very hard task to move those to Kanto plain. It is not as simple as move landed stuff from Sakai's port to all over the country. I think they used many different route to spread through. Did domestic gunpowder production started much more earlier? I know something happened for sure,but I just don't know. That's why I just wanted to start drawing pack of lies in my own way. MG: That will be Zassou note (also known as Hayao Miyazaki's daydream data note published in Japan. 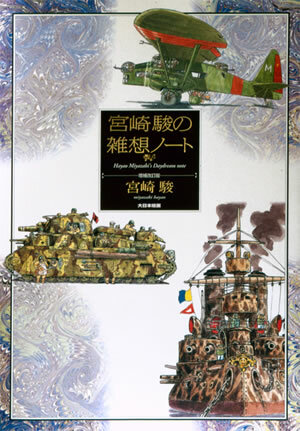 13 episodes illustrated comic with of his own ideas of tanks warships and airplanes) of Sengoku period for sure. There will be note on the first page "There are no real data material value on this book" I think that is more interesting. All the battle scene in movies and television are shot at very large plain field like a farm land or gulf course. There are not many places like that in Japan. Those scenes just look fake. Miyazaki: But if I draw hyper active battle field before the all those knowledge based low-keyed manga,it will be bird of a feather because the battle will be on large wild field. If I make the scene with a lot of wild grass and weeds, battles will be so very troublesome and horses won't be able to run, they simply won't run. Thats the reason I started to think "What I'm I going to do?" There are very well equipped samurais and there are not so well prepared samurais if I try to draw both of them in detail, the task became so much work, I think starting this project was my cushion for my retirement. I will come to this my personal office everyday, in the end I must show up everyday, (because of the ongoing project at GHIBLI museum, he was very busy man at the time) I didn't pay much attention in the beginning of this project, but I got more and more involved to it. First I did not care to draw horse harness in detail but I had to think again and thought "Wait, I must draw those more correctly"
Wind may change again sometime but for now, all the finished drawing will be shoved in somewhere. I probably be stunned by those later because of the luck of progress. Interviewed at Nibariki office at Tokyo Koganei 26th March 2015. There for,since Monthly Model Graphix will be on the book store's shelf after the release of the issue of Armour modeling, we are avoiding the overlap and reporting what we couldn't publish on the interview on Armour modeling. 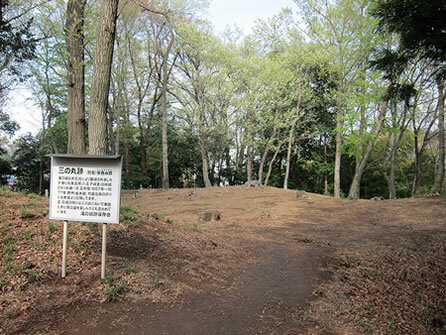 Miyazaki: There are ruins of stronghold in Tokorozawa, Saitama(a prefecture right next of Tokyo). MG: It was a in a front line of war between the Hojo's and the Uesugi's(Both powerful feudal lords of its time). The stronghold was Hojo's side building if I remember correctly. Miyazaki: I read some written materials about this Tokorozawa stronghold. I think it was call "Taki no shiro"(meaning waterfall castle. The word "castle" use to describe many military structures such as garrison or strongholds). One of the Hojo's samurai Ujiteru Hojo visited here sometime and had tea ceremony in this small area. This place is so small, inside of core defense wall only made of a shrine and small bordered area in front of it. I wonder how many people can fit in there. May be no one was stationed there. Stationing place for the army was located under side of third defense ring.The strongholds of its time may be totally different from what we are imagining right now. MG: The first time we heard about concept of "Teppo samurai "(meaning matchlock samurai), you told us a story of our antagonist. "When he move to a stronghold for guard duty, he uses farmer's kids to carry his stuff. But he doesn't want to feed them lunch so he must have start travel very early in the morning and sent them home before noon." It was so far from what hero would do, and it is interesting story to tell. Miyazaki: I wanted to show a realistic battle like that at this stronghold. Like how those structures are built. This stronghold in particular is made of red　clay. It will be cover with weeds in short time, and make the wall crumble, so they have to mow the weeds and grass. Was that a job for samurais to do? Weeds in Japan grows really fast too. They have to rebuild the fences in once in every three years. It is just dreadful to think about those. You have to mount clay wall high and thick too because those matchlock can penetrate quite thick walls. The wooden frame loopholes are full of blind spots too if you make those on the clay walls. I just don't know. I thought I can find out by drawing it. MG: It's like our readers, They need to build models to understand. Miyazaki: One of the of materials you brought me was a book of Odawara offense(A military campaign in 1590 against the Hojo's started by Hideyoshi Toyotomi who was one of the most powerful feudal lord in tis time),and I got little nervous reading it. Those loopholes had many blind spots That is why when they are charging, some guys can pop out of nowhere. MG: The book is "Army of Sengoku period". It was a story of Yamanaka castle" (a castle in Shizuoka prefecture which was by the Hojo's). Miyazaki: That was very realistic. To sum it up, it was not all about beating the opponent or winning the war. They just waned their side of the flag to be on the top ground. Samurai's job is to murder opponents and you can see how they try to get most out of their achievement but they are also a realist so it made the story more amusing. Their tasks are very self centered. They even hide within enemy force to crossing a bridge to advance. I guess they could not tell who is fighting on which side in a middle of a battle. MG: I guess they were fighting in the middle of mayhem. Miyazaki: It will be awful to try to draw all of this. I visited the "Takino shiro"(Water fall castle) many times wanting to do this. But what I realized was "I've gotten older and this takes too much effort" I should have start drawing with a pencil,not a pen. 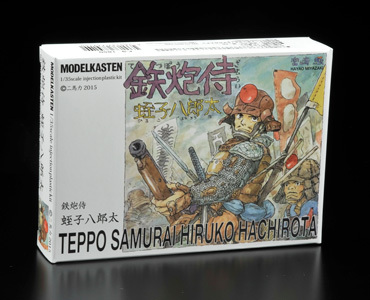 MG: What do think of this Hachirota Hiruko (The antagonist of Teppo samurai)? Miyazaki: May be his chest is too thin, making him look weak. if this part was joined together they couldn't move at all. Those must have been tie together somewhere to support the weight but I can't figure it out. I'm sure they put on many things around their waist. Those things must get in a way of movement. Do they still need to carry sword? But my habit to draw like this. I don't know the truth at all. 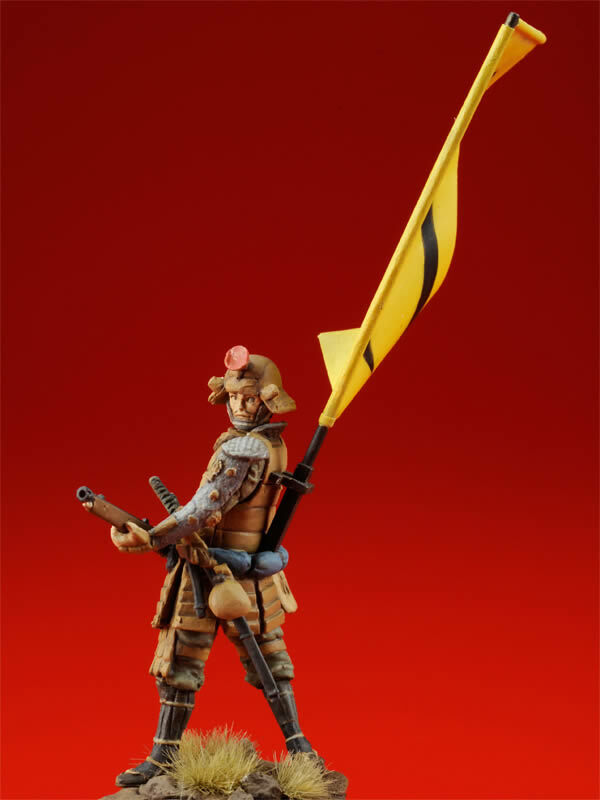 MG: Samurais with matchlock had "Tachi"swords (Japanese sword which developed for cavalry battle) hanged from their belt, because in kneeling position, the sword will bump against his waist if they insert the katana sword between their belts. Miyazaki: I think so too. if the sword bothers him, he can wear it in the rear of him but I think it'll still be annoying, Carrying sword is nothing but trouble for firing matchlock. May be they only had a matchlock and bamboo cap. One thing came to my mined while I was drawing. I think movies must use really heavy armour for actors to wear. That's why we can't use movies as references to find the truth. You can see how light those are when they walk around so casually. I hear actors were so happy when they found out the costumes are made of paper because plastic ones were too heavy for them to wear. They need to wear heavy armour so they can change way they walk. All background actors should be played by riot policemen. No one had desire to correct sponsors anymore to portrait the atmosphere of that time. Interviewed at studio Nibariki. Koganei, Tokyo. 3-26-2015. Historic strong hold ruin site sits in just out side of Tokyo. Takino shiro（Waterfall castle)is a strong hold on 25 meters height hill located at where Yanase river and Higashi river merge in Saitama district in Japan. It was a strong hold on the frontline and the watch was stationed with rotation system. It was overrun by Hideyohi Toyotomi(One of the most powerful feudal lord in its time) in year 1590 when he started Odawara offense. It is now a designated historic site of Saitama district and preserved carefully. これが三の丸跡。本当に小さい。滝の城は遺構が比較的よく残されており、当時の城の様子がわかり、とてもおもしろい。 全体的にコンパクトな作りなので、全部を見て回ってもさほど時間はかからない。でも起伏が大きく、けっこう体力は使う。This is remain of third defense walled area. You can see how small it is. Waterfall castle's ruins are actually well preserved and you can see the state of its inside. It is very compact al around and it doesn't take much time to see everything but the area is full of undulation so sure does make you work out. 本丸跡に建っている城山神社。この神社を中心とする「滝の城址公園」は埼玉県所沢市城23-1、JR武蔵野線の東所沢駅から徒歩19分。駅からはバスも利用できる。また滝の城の1/220復元模型は、所沢市、生涯学習推進センターの3階に常設展示されている。Yamashiro shrine in remain of the core defense wall. 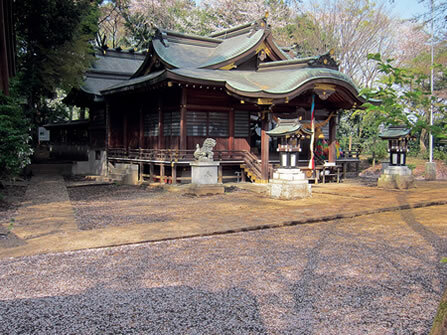 "Takino shiro ato park" is centered around this shrine. The park's address is 23-1 Shiro Tokorozawa Saitama. 19 minutes walk from Japan railway's Higashi Tokorozawa station.You can also use a bus from the station. You can check the 1/220 reproduced scale model of the strong hold in 3rd floor of "Shougai Gakushu center" in Tokorozawa city. That is all. We still don't know when Teppo samurai will start or finnish. 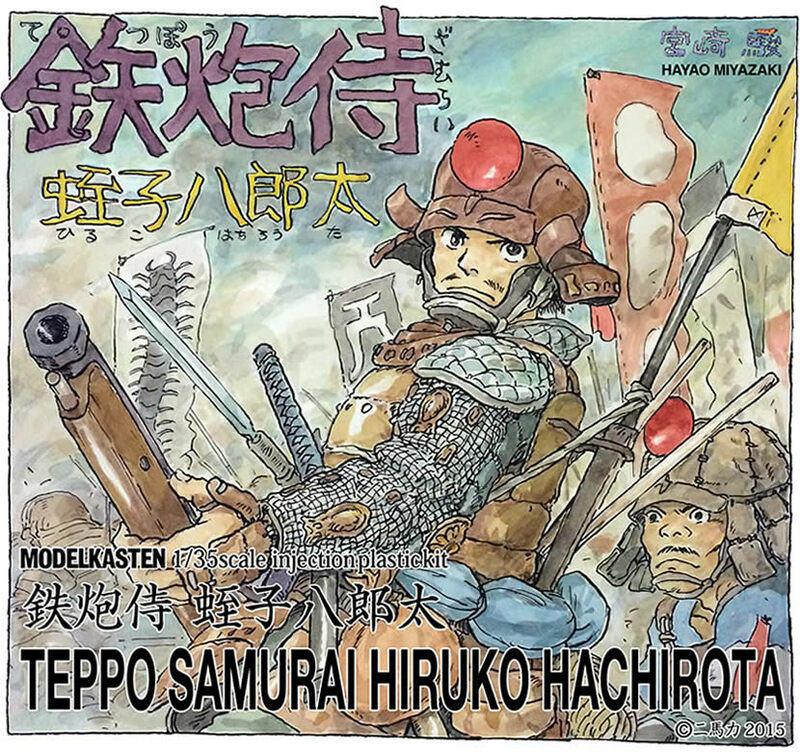 Our readers must be bit confused with this announcement of canceling Teppo samurai even before the monthly article began, but those finished 10 pages are full of battle scenes with great density and accuracy. We just can't believe those great works will never see the light of day. Anyway, we made the figure and going to sell it way before the realization of publishing the article itself. Please visit your local temple or shrine to pray for the Teppo samurai's return as we will keep publishing Sengoku time period article on armour modeling hoping for its return as well. This is 1/35 scale injection plastic model of Hachirota Hiruko. This picture is test shot with deformed thin chest plate. The production model is without this problem. The figure will be on sale at Modelkasten booth in modellers free market site during Shizuoka Hobby show. 5月16日、静岡ホビーショー会場に隣接するモデラーズミニフリマ会場内に特設されるモデルカステンの「立ち読みパラダイス」で先行発売される蛭子八郎太1/35インジェクションプラスチックフィギュア1850円（税別） On May 16th 2015, Hachirota Hiruko's 1/35 scale figure will be on sale at Modelkasten booth in modellers free market site during Shizuoka Hobby show. パーツ分割は写真のようにまるでパズルのようだ。所定のポーズにはきっちりと組み上がる。ただ改造しようとすると、いつもとはちょっと勝手が違っちゃうかも。 As this picture shows those parts are just like puzzle pieces and those will fit perfectly. Modding this figure will be little tricky.